Working on my latest page for the new Pages with Papertrey, hope to have that up on the next couple of days. It's based a card dawn made for a earlier MIM, it was a great simple layout to adapt. I used the PTI number dies negative to sponge some versamark on the newsprint, emboss with clear ep and sponge some SU pool party ink around them. A corrugated star, some scalloped canvas and some star trails make this card fun ! 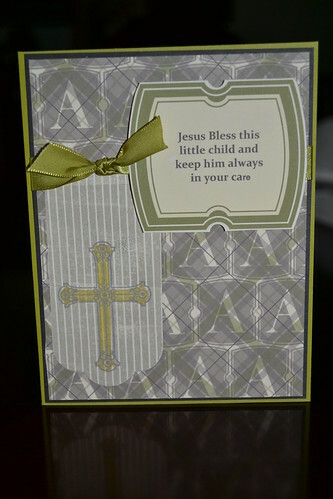 Next is a card I made using Stampin Ups digital software. I used some argyle DSP, and then took an A letter stamp. Changed the opacity so you could see the argyle underneath, and repeated the pattern over the whole card. The sentient frame is the same letter stamp enlarged. Used my Half and half dies, along with everyday blessing from PTI. Look at this package I got from fellow forum member Joyce (you may know her by her owl drawing avatar that her talented daughter drew !!) 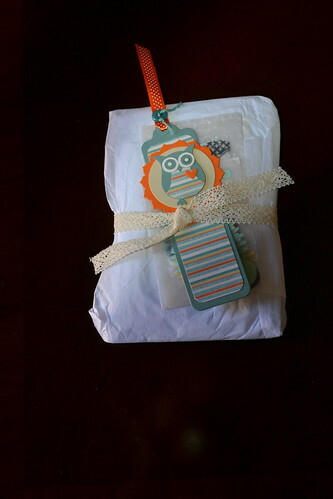 She ordered some things for me and had them sent to Canada, and look how adorably it was packaged ! And lastly, the biggest happening this October in my home is this. My little guy..well my big guy...off to his first day in kindergarden !! He's still 3 (4 in a few weeks) and he was so excited to go. Didn't give me a second look !! Happy birthday to your husband. I love this card. I must have missed that technique, but it looks so cool. I'm glad you explained it, or I never would have figured out what you did. And that digital card--you are younger than me, because I still haven't figured out that world, yet. And, what a cute picture of your little guy. 3 is pretty young for kindergarten--but, I'm sure that the only one with separation anxiety is mom! Thanks for the shout out about my package. Holy cow, we don't start kindergarten until the kids are 5 here...that's a whole year earlier! 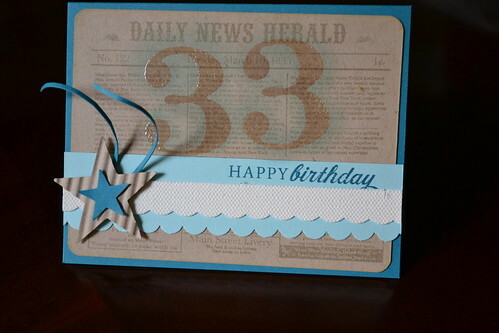 And I love the embossed 33 on that card...great colors for a man card too. Love that birthday card! Thanks for giving some details on how-to. 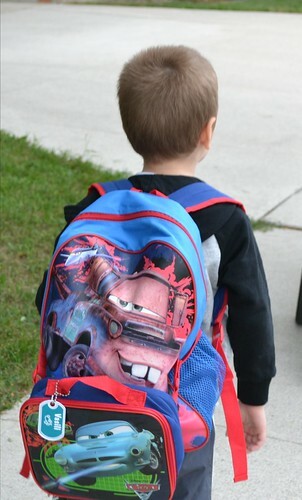 Good luck to your little guy starting school! I still have a few years to go for mine, but am already getting teary thinking about it!